Before talking about my reactions to making mistakes in knitting, a few notes about the Primrose handkerchief. The central portion of the pattern came from a book I bought on deep discount when I first started knitting, Traditional Lace Knitting by Furze Hewitt, published in 1997 by Kangaroo Press. The original pattern had a different border, which I did not really like and was having a hard time getting it down. So after so playing around, I ended up using the border from the Syrian Shawl from Victorian Lace Today by Jane Sowerby. 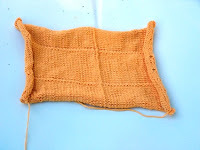 I also knit the border on larger needles (size 1 as opposed to size 0), which is why the edge has a more delicate feel. So with the completion of one item, I was ready to start my next project. But then I remembered my finish five rule. So I dug through my unfinished objects. I finished this little cape, which will end up going to my niece. This was originally 1/2 of a poncho. But I completely lost interest in finishing the second half (mainly because I had forgotten what I was doing, and it was an improvised pattern). So I picked up stitches along the side edges with a light blue ribbon yarn and knit a few rows. This provided the base for the ties. Now I have a cape, which hopefully my niece will wear. I don't think she likes playing dress up as much as I did as a kid. Last year I made her a mermaid tail (of which I need to get a picture) and she did not really like it. She is more into sports. But we will see. So that was two things completed. I had decided from the start that ripping out unwanted or unusable items would count the same as finishing a project. So, I started ripping. Gone - the tiny fortune cookie bag. Gone - the handspun scarf that wants to be a hat. 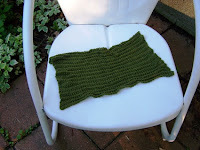 Gone - the weird-shaped hemp towel/washcloth thing. Well not gone, but returned to yarn. All of this ripping was because I needed to start knitting on another wedding handkerchief. I am almost certain that the intended recipient does not read my blog, so it is not as much of a secret. I needed new yarn for this project, having used up all my previous crochet thread. Knitting lace in crochet cotton has to be the most money efficient knitting. I bought DMC Traditions Crochet Cotton, 400 yards for about $2. And it is really, really soft. So I chose a lace panel pattern from Barbara Walkers A Fourth Treasury of Knitting Patterns. 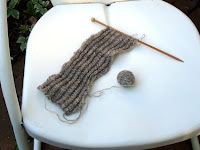 I was motoring along on the knitting yesterday morning and when I had finished I noticed the mistake. A misplaced yarnover, about 8 rows down. My first reaction was to leave it. No one would probably notice. I even rationalized it - the mistake could symbolize marriage, potentially beautiful despite its imperfections. Then I had to go to work and set the piece aside for the day and overnight. After stepping back from the work for awhile I realize that I wanted to fix the mistake. I want the piece to be as perfect as I can make it. Then I realized that this is how I react to all my knitting mistakes. At first I think I can live with it. And then I set it aside for a few hours or a day. Upon coming back to it after that time away, ripping out to the mistake does not seem so painful, but rather the right thing to do.